From unpacking, loading, folding t-shirts to handling children’s activities, the Academy Ambassadors worked hard to make sure over 500 MAFP Annual Meeting attendees had a great time this past July. 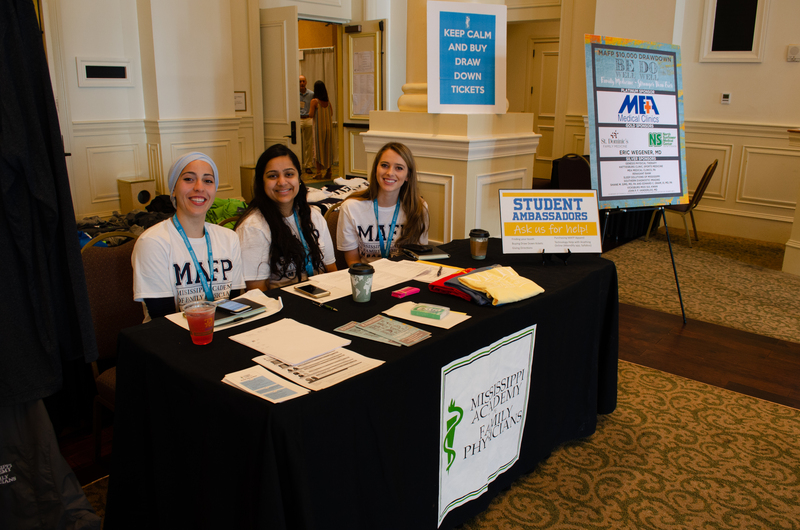 As part of the program, medical students attend the MAFP Annual Convention, in exchange for their assistance with planning and putting on the event in Destin. MAFP chooses student applicants who are interested in family medicine and pays for their registration, hotel room and meals for the week. Hattiesburg Clinic also hosted a dinner one night for the group. During the meeting, they networked with practicing physicians and exhibitors and even had free time to have fun together! Some attended the Charter Fishing Trip or played golf, and several attended the glass art activity and went watersliding. Medical students apply each spring to be Ambassadors and applications for next summer are now available. A limited number of students are accepted each year, so apply early!